Low frequency multidifferential eddy current probes developed in Leotest Medium Center (Karpenko Physico-Mechanical Institute satellite partner) and some experimental re- sults obtained with this probes are presented. The main features of LEOTEST type probes are large depth of inspection, excellent lift-off suppression, high local resolution, small size (best ratio of penetration depth to probe size) and flaw sizing ability. Fig 1: Typical multidifferential EC probe and spatial distribution of signal response. Eddy current (EC) method is one of the most perspective for detection and estimation of subsurface flaws of different types, especially for in-service detection of dangerous fatigue and corrosion flaws in structural components in aircraft, nuclear power plants etc. The differential type EC probes are applied in situations where the good suppression of disturbing influences (such as probe lift-off or inclination, conductivity changes etc.) on the EC probe signal is needed. Differential types EC probes have better noise suppression and selectivity in comparison with absolute EC probes and are used for the most EC flaw detection applications. But differential EC probes also have some disadvantages, for example the sensitivity to probe inclination relatively to the tested surface. For better flaw detection selectivity the dual differentiation and appropriate pick-up coil connections may be applied during the EC probe development (1-7). Especially, this is effective when the dual differentiation is performed in two different directions. The well-known Forster EC probe and the slide type EC probe for rivet zone testing can be presented as examples of the most effective multidifferential EC probes (6,7). One of the most typical construction of multidifferential EC probe and corresponding spatial signal distribution is schematically presented in fig. 1 (5). But the selective possibilities of multidifferential eddy current probes and new practical possibilities of this kind of probes are not enough investigated and developed. In this paper we present some new results obtained with new LEOTEST family multidifferential low frequency EC probes developed in Leotest-Medium Center (Lviv, Ukraine). The dual differentiation (in different directions) and corresponding connection of the EC probe coils is used to reach a better selective ability and sensitivity (1). The next constructive feature is the spatial separation between the transmitter and the receiver coils mounted on the ferrite cores that are equal or close by radius. Such type EC probe can be classified also as non-axial EC probe. It is investigated that for given operational frequency the probe coil separation determines the eddy current penetration ability in the same way as the coil radius. So, good penetration can be achieved even with small coils and small sized high penetrating EC probes can be obtained. On the other hand, the small size of the probe coils enables a better spatial resolution (1). Due to non-axial construction this type EC probes are sensitive to conductivity anisotropy. In this case for good noise and disturbing signal suppression it is very important to guarantee the parameter identity of the multiwinding coils installed on ferrite cores. Good parameter identity of coils depends, among other things, upon the identity and stability of ferrite cores magnetic and geometrical parameters. On the base of optimum ferrite material choice and new precise producing technology new type of small size low-frequency EC probes with a sharp response at low operational frequencies were designed in Leotest-Medium Center. The special calculations also were done for the ferrite core coils sensitivity optimisation at needed operational frequencies. One of the possible small-size receiving coils constructions is represented on fig. 2 (4). In this EC probe special slots in ferrite core for wire package were made to decrease the probe size and the base of signal differentiation for better noise suppression during the scanning in the non-homogeneous (for example, welding) zone. Fig 2: Multidifferential probe with optimised resolution. In fig. 3 the typical 3-D signal response of four-coil multidifferential EC probes is shown when scanning a spot-like flaw. Due to the asymmetrical (in reference to the probe axis) construction the signal response depends strongly on the direction of scanning and crack orientation. It is interesting that for crack-like flaws the probe has a quasi-absolute signal response if the scanning direction is coincided with the main probe orientation (point on the probe case) (see fig. 4, 5). Fig 3: Signal distribution from a spot-like flaw. Fig 4: Impedance plane signal of a flaw with 3 mm residual depth in aluminum. Fig 5: Impedance plane signal of a flaw with 1 mm residual depth in aluminum. The LEOTEST family EC probes designed for different applications and some of their features are presented in the table 1. All probes can be adapted for different EC devices (Rohmann ELOTEST, Fraunhofer Institut MFEC1-4 EC device, FORSTER devices, TMT devices etc.) with the LEMO or FISHER connectors. Residual depth here is defined as distance from tested surface to upper edge of flaw. Table 1: Low frequency LEOTEST type EC probes. The presented EC probes were investigated at Magdeburg Otto-von-Guericke University in connection with EC device ELOTEST B1. The crack-like artificial flaws were simulated with the standard specimens (produced by ATG, Prague) with subsurface prolonged flaws with residual depths Hr = 3 mm and Hr = 1 mm (from different sides). In fig. 4 and 5 the results obtained with the low-frequency EC probe MDF 1201 at operational frequency 2 kHz are presented. Another EC device setting is presented in the figures. Different gains for detection of flaws with different residual depths were used. In fig. 4 and 5 subsurface flaw signals are compared with full lift-off signals (separation from tested surface more than 100 mm). We can see sharp signal response for the subsurface flaw and strong lift-off suppression. So these results have confirmed higher opportunities of new probes, especially at detection of subsurface flaws. Fig 6: Impedance plane signal of hidden flaws in stainless steel. The local flaw detection ability of LEOTEST type multidifferential EC probes was also investigated at Magdeburg Otto-von-Guericke University in connection with scanning system for two-dimensional pseudo-colour visualization (9). The local flaws (like corrosion pitting) were simulated by drillings of different depths in a 30 mm aluminum plate. The experimental setup and the two-dimensional presentation obtained with PC-aided EC scanner system for subsurface flaws with different residual depths are presented in fig. 7. From these results the performance of LEOTEST MDF 1201 EC probe can be estimated. The hole is detectable up to a residual depth of 8 mm. Fig 7: Indication of hidden holes with different residual depths. The sensitivity and the spatial resolution of LEOTEST type EC probes to local pore-like flaws were evaluated in Uppsala University using sandwich specimens to simulate the flaws of different volumes and located at different depths in copper canisters (10). The specimens have three layers: the upper one for simulating residual depth, the middle one with the holes, and the bottom plate. EC response of 1 mm hole at the depth of 2 mm is presented on fig.3. The EC probes were connected to the ESR Rohman PL.E EC device. Operational frequency 720 Hz was used. A series of measurements was performed to evaluate and compare the performance of the selected EC probes. Linear scans of six holes with diameters dh from 0,8 mm to 3,0 mm, placed under upper plates with depths td from 1 mm to 4 mm, were performed. The holes had different volumes due to the variable thickness th of the middle plate. Sensitivity: MDF 1201 probe is capable of detecting all holes ł 0,8 mm in the specimen. Hole with diameter 0,8 mm at the depth of 4 mm is detected with S/N ł 5 dB. Signal to noise ratio (S/N) increases with the hole diameter and decreases with its resid- ual depth td , however, it is relatively insensitive to the hole height th. Signal amplitude (level increases with the hole diameter and decreases with the hole residual depth td , however, it is relatively insensitive to the hole height th. Some parameters of Leotest MDF 1201 EC probe were compared with parameters of another known commercial low-frequency EC probe. The comparative investigations will be presented in detail at the same conference (10). The spatial resolution of EC probes was estimated by the spot dimension estimation on the two-dimensional signal response (10). Results obtained can be presented in the next comparative table. Table 2: Comparative parameters of Leotest MDF 1201 and commercial EC probe. Leotest MDF 1201 probe has best sensitivity and penetration in spite of very small size. Thus this probe has best ratio of probe size to penetration depth. Leotest MDF 1201 probe has best spatial resolution. With EC method it is possible to detect the local corrosion changes on invisible surfaces even in the case when cracks, corrosion pits and caverns are situated on reverse surface of the sheet. The sensitivity of eddy current method in the case of non-ferromagnetic materials is high enough for quantitative estimation of size and residual thickness of sheet under the corrosion pits and caverns. 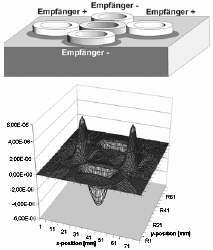 With the application of EC method it is possible to estimate all parameters of corrosion pits (the diameter and residual thickness). The two-parameter eddy current test results obtained with EC device and multi-differential EC probe (close by parameters to MDF 1201) on operational frequency 64 KHz are shown in fig. 10 (11). Fig 10: Dependence of signal response amplitude and phase angle on diameter D and residual thickness hocr. The local corrosion pits are simulated by artificial flat bottom drillings with different diameters (D =1 8 mm; 3.0 mm; 4.5 mm; 6.0 m and 9.0 mm) and residual thickness (thickness of sheet minus drilling depth) - ( hocr = 0.5 mm; 1.0 mm; 1.5 mm; 2.0 mm; 2.5 mm and 3.0 mm) drilled in 4 mm thick titanium alloy sheet. Figure 10 presents the principal signal behavior in impedance plane in dependence of diameters D and residual thick- ness hocr. From these results we can see that residual thickness in local corrosion zone is determined by the eddy current signal phase angle independently of the holes diameters. These results were used for special eddy current device development. The main feature of this device is the combined (absolute plus differential) eddy current probe application and the separated flaw signal phase angle measurement. In such combination it is possible to evaluate and estimate common and local corrosion damages simultaneously (11). The flaw characterization and sizing ability of the probes are confirmed also during the investigations carried out in Uppsala University using sandwich specimens to simulate like pore flaws in copper canisters (see item above and ). The results obtained show the Leotest type EC probe possibility to make characterization of like pore flaw using phase and amplitude of their signal response (10). The possibilities of the Leotest MDF probes to estimate another flaw parameters (crack size, residual depth, crack inclination etc) were presented in papers (11,12). Some new testing technologies with the Leotest MDF EC probes applications in aircraft and space engineering were developed (1-3). The probes were applied to detect cracks in interior part of multi-layer aircraft constructions, to detect crack under dielectric protection coatings, to detect cracks under the rivet heads, to detect subsurface pores and oxide films in aluminum welding etc. The new application is the detection of internal cracks in small size titanium blades (Leotest MDF 0701). Due to small size and flaw sizing ability Leotest probes may be recommended also for heat exchanger tube testing with rotational tool. Due to the features presented above Leotest MDF type EC probe can be used in aircraft, space engineering, nuclear industry etc. for detection and estimation of different type surface and subsurface flaws. Additional information by e-mail: leotest@org.lviv.net. V. Uchanin, New Type multidifferential Eddy Current Probes for Surface and Subsurface Flaw Detection, Zeszyty Problemowe. Badania nieniszczace, Warsaw, 6, 2001, pp. 201-204 (see also: www.usndt.com.ua). V. Uchanin, V. Tsirg, The experience of low-frequency eddy current device application for hidden fatigue and corrosion flaw detection, The Technical Diagnostics and Nondestructive Testing, 4, 1989, pp. 71 - 75 (in Russian). V.Uchanin, V. Tsirg, The detection of hidden corrosion damages in aircraft constructions by eddy current method application, Physico-chemical mechanics of materials, 4, 1990, pp.103  104 (in Russian). V. Uchanin, Ju. Grabskij, Eddy current transducer, patent certificate 1767409, Bulletin of inventions, Moscow, 37, 1992 (in Russian). G. Mook, H. Bauke, V.Uchanin, Wirbelstromprüfung mit hohen Eindringtiefen Theorie und Praxis, Conf. DACH-Tagung der DGZfP, ÖGfZP und SGZP, 2000, Innsbruck, BB 73 Band1, pp. 145-154. F. Forster, Eddy current testing systems with means to compensate for probe to workpeace spacing, Patent 3611120 USA, G 01 r 33/12, 1971. J.-L. Arnaud, M. Floret, Procede et dispositif pour lexamen non destructif de junctions rivetees ou analogues au mouyen dune sonde a courants de Foucault, Patent 2541772 France, G 01 N 27/90, 1983. R. Becker, M. Disque. Neue Anwendungsfelder der Wirbelstrompüfung durch Einsatz einer Prüfelektronik mit großer Signaldynamik und eines Digitalen Signalprozessors (DSP) mit hoher Rechenleistung, DGzfP DACH-Jahrestagung 1996, Lindau 13.-15. Mai 1996, Vortrag 42; Berichtsband 52.1, pp. 365-372. G. Mook, V.Uchanin, The visualization of nondestructive eddy current testing results, Physical methods and means for media, material and product testing, Leotest Medium Center, Lviv, 2000, Vol. 5, pp. 9  16 (in Russian). T. Stepinski, Deep Penetrating Eddy Current for Detection Voids in Copper, to be presented at 8th ECNDT, Barcelona, June 2002. V. Uchanin, The methods of quantitative eddy current testing with flaw parameters estimation, Technical Diagnostics and Nondestructive Testing, Kiev, 1, 2002 (in Russian). V. Uchanin, The distribution of the electromagnetic field above inclined crack and their parameters estimation, 2 nd Int conf. Computer Methods and Inverse Problems in Nondestructive Testing and Diagnostics, Minsk, 1998, pp.139 - 144.